Paper Art by the persephone papers. Xaolynn is holding a piece from the White Flower Collection. From the Black Flower Collection. A black paper flower sits perched atop thick black card stock foil stamped in gold. The white interior allows you to write the perfect sentiment with your favorite pen. 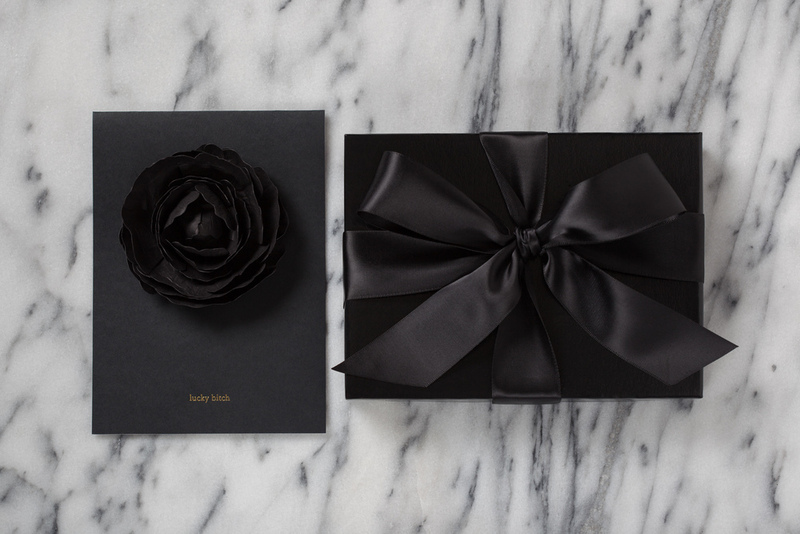 Includes black gift box, black satin ribbon for in-person giving, and a white mailing label just in case you need to snail mail your card. From the Looking Glass Collection. A whimsical three-dimensional holiday scene tucked in a French blue mailing tube, finished with gold end caps. Address and write your message directly on the label. Includes a display stand inside the end cap. Everything we create is a little piece of mailable art. From the Looking Glass Collection. From the Stone Collection. We wanted to really expand the boundaries of stationery. 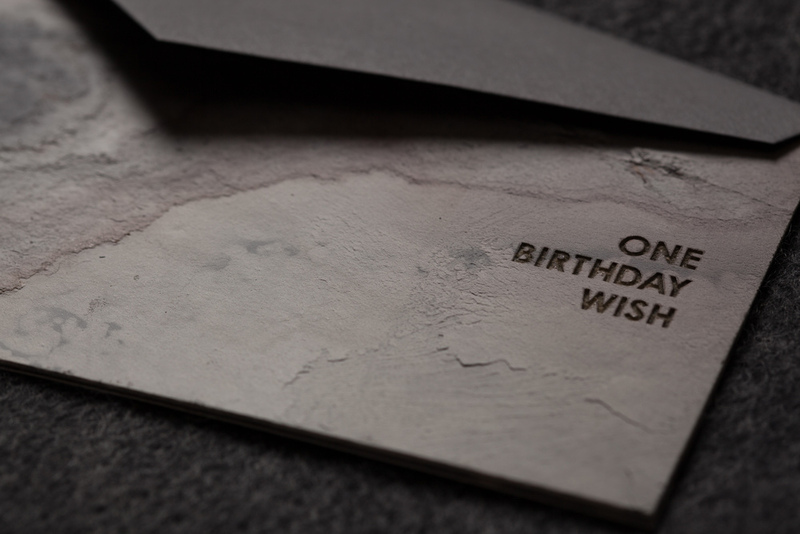 We love exploring typography on unexpected materials like brass and natural stone. From the Stone Collection. Flat card backed with laid textured paper to enhance your writing experience. Display stand included. From the White Flower Collection. A handcrafted white paper flower sits perched atop white card stock foil stamped in gold. Card is made from 100% post consumer waste. Includes grey gift box, white satin ribbon, and matching white mailing label printed with gold ink. From the White Flower Collection. A handcrafted white paper flower sits perched atop white card stock foil-stamped in gold. Card is made from 100% post consumer waste. Includes grey gift box, white satin ribbon, and matching white mailing label printed in gold ink. From the Brass Collection. "Our collection is really inspired by art, architecture, and especially fashion. Our Brass cards were a homage to a necklace by Jennifer Meyer that I wear religiously. It feels simple, personalized, and very refined, and I wanted to translate that into stationery." From the Brass Collection. Sentiments engraved on brass cartouche. Includes charcoal envelope. From the Gratitude Collection. 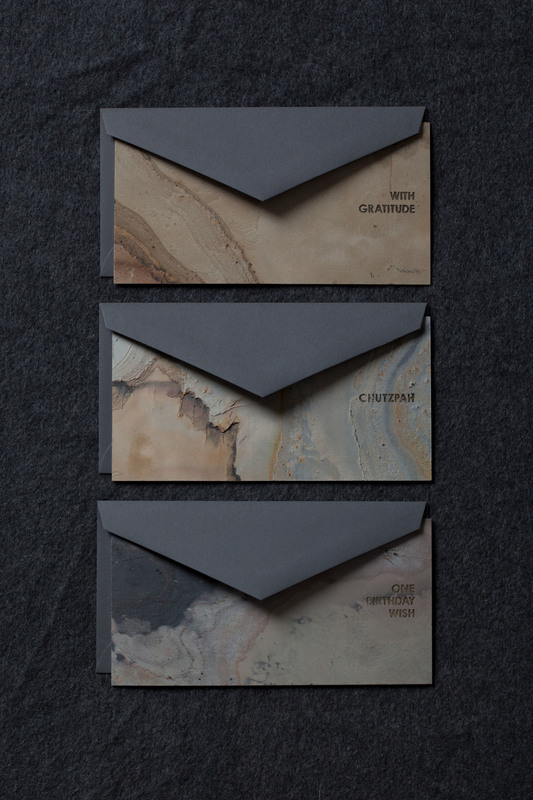 "Our Gratitude line was born from the fact that it was hard for men to find a thank you card that was masculine and tailored." Gold foil on thick colored card stock- stamped hard enough so that you can feel the type. Available in Hunter, Burgundy, Navy, Light Blue, or Grey. Includes charcoal envelope.